An antique late Georgian period necklace comprised of graduated oval chrysoprase set in foliate surrounds with alternating trefoil ruby florets, in 18k gold. A similar necklace appears in The Frick Collection's portrait of Comtesse Daru, painted by Jacques-Louis David in 1810. A Retro gold necklace of twisted, reversible design comprising flat scaled links on one side and gatelinks on the verso, in 18k. France. 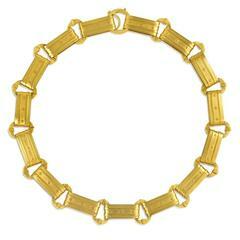 An antique gold necklace of oblong links joined by brick link intersections, in 15k. England. Composed of a series of diamond and ruby quatrefoil motifs, mounted in yellow gold, 16,6 ins. The total weight of the diamonds is approximately 8 carats Weight 75,9gr.